Service Automation Certifications and training fulfill the vision of the Service Automation Framework Alliance by fostering greater collaboration, productivity, and success among team members in order to design and delivery automated services. This global movement transforms organizations and takes them to higher levels of performance. The Service Automation Framework Alliance has developed appropriate training programs for each level of individual contribution to team efforts. Our certifications provide assurance that team members can immediately impact projects. As individuals progress through our training programs, they help their teams achieve higher levels of performance and success. Service Automation is a living, breathing framework. Its continued success is based on learning from successful implementations on actual projects and case studies. The Service Automation Framework Alliance recognizes that key factor in our training and certification scheme. Rather than providing simple, one-time training, our programs offer ongoing career education and support through a platform where training participants can download the latest templates for practical use. This educational model provides more meaningful training that helps people stay current with best practices. Further, as part of the Service Automation Alliance community, members interact with their peers and continuously develop their capabilities. Service Automation Foundation: This entry-level certification tests whether delegates can recall key concepts and terminology of the Service Automation Framework. 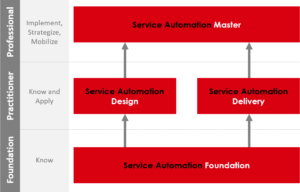 Service Automation Design: This intermediate-level certification tests whether delegates can apply the theory of the Service Automation framework to design automated services. This certification tests design concepts. Service Automation Delivery: This intermediate-level certification tests whether delegates can apply the theory of the Service Automation framework to deliver automated services. This certification tests process application. Service Automation Master: This expert-level certification test whether delegates are able to formulate a long-term strategic road map in order to execute a digital strategy based on automated services. For each certification, a corresponding training course is offered through Certified Automation Partners. The Service Automation Framework Alliance works with a network of certified trainers who can become accredited to deliver the different Service Automation training modules. More information is available through our partner program.